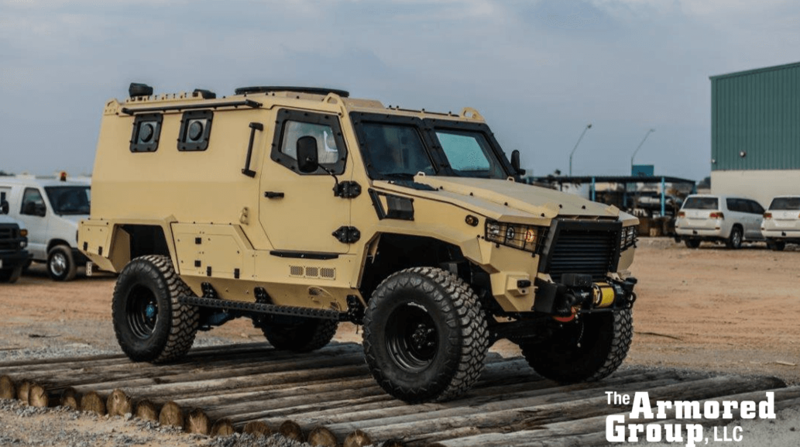 The Armored Group (TAG), a leading worldwide provider of armored vehicles, has just introduced its newest law enforcement vehicle, the Terrier LT-79. This new vehicle developed by the TAG Research and Development Team represents a well-balanced combination of protection, off-road mobility and payload. Most importantly, it offers unparalleled tactical mobility and survivability to armored vehicle end-users worldwide, in any climate or setting. The standard Terrier LT-79 will hold up to eight officers (2+6 in individual MIL-STD seats) or alternatively, seating for 10 (2+8) with optional bench seating, depending on the size of operators and amount of gear. The vehicle is agile and extremely versatile and is designed to protect individuals in dangerous operational environments. The vehicle is bound to become a vital means of transportation for SWAT teams, law enforcement and military personnel that need a highly armored vehicle while staying economical and budget friendly. The Terrier LT-79 is built using a reinforced and militarized Toyota VDJ79 truck chassis, and COTS components. The vehicle can be built to B6 or NIJ-III protection standards and is powered by a 195 HP high sulfur 1VD-FTV Toyota 4.5L V8 diesel and readily available in LHD and RHD configurations. Using upgraded axles, clutch and a reinforced frame as well as large super single wheels, the vehicle combines excellent mobility and high payload in all operating environments. “The Terrier LT-79 is a modern era hybrid that combines the requirements needed for combat and fire support situations as well as mission-specific roles such as transport and logistics. The new Terrier LT-79 was designed on the Toyota chassis because parts are widely available enhancing serviceability in many parts of the world. It is also an affordable option to end users that need superior protection and fleet longevity while staying within their budget parameters,” said Robert Pazderka, President and Founder of TAG. The Armored Group (TAG) has over 25 years of experience engineering, designing and manufacturing armored and non-armored vehicles for use by government military agencies, law enforcement, private businesses, and individual citizens needing a high level of personal protection around the world. TAG engineers, designs, manufactures and modifies vehicles for any terrain and any environment. TAG provides the highest quality armored vehicles available and sets the standard for customization, reliability, and protection. To ensure that all TAG vehicles meet the highest standards of safety, they undergo extreme ballistics testing and have received VPAM-BVR 2009/VR7 and VR9 Ballistic and /ERV 2010 Blast Certification with up to 18,5Kg TNT for their Toyota Land Cruiser and Toyota Hilux, Toyota 70 Series, Nissan Patrol and Lexus LS460 armoring solutions. All TAG facilities are ISO 9001 certified and managed by fully qualified and experienced professionals who serve customers around the world. TAG is a full-line manufacturer of armored and specialty vehicles and has provided customized engineering, design and manufacturing solutions to the highest-level clients in the world. Some of them include the U.S. Navy – SPAWAR, DOS, DOD, USSOCCENT, USSOCOM, U.S. Army and Air Force, United Nations, NGOs, KBR, Lockheed Martin, DynCorp, Loomis, Brinks and many foreign governments and agencies. For more information, please visit these company websites: https://www.armoredcars.com and http://www.swat-vehicles.com or call 1 888-997-5607 or 602 840 2271.